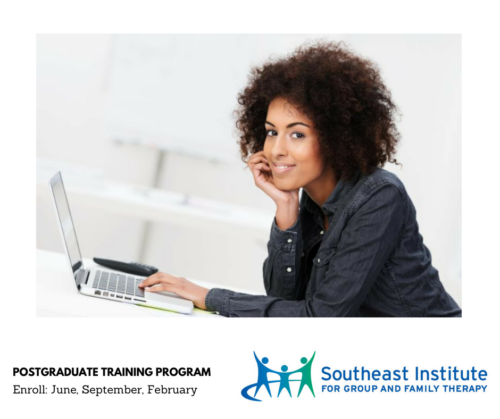 The Southeast Institute for Group and Family Therapy Postgraduate Training Program offers a unique opportunity for personal and professional growth. If you are ready to immerse yourself in an enriching environment that offers both nurture and challenge, we have a program designed just for you. We created the one-year Postgraduate Training Program for professionals with an advanced degree in a discipline related to the study and practice of psychotherapy. This program is for those psychotherapists working with children, individuals, couples, families, and groups who want to deepen their personal journey to expand their professional journey. To that end, we offer an experiential program that builds on your strengths, cultivates your inner wisdom, fosters confidence, and offers personal healing. You will be challenged to grow and develop resources to become competent therapists and more powerful agents of change — in your life, in your work, and at all levels of society. Southeast Institute for Group and Family Therapy has a nearly 50-year history of creating models for personal, professional, and social change. Vann Joines, Ph.D., Director of Southeast Institute, is dedicated to living authentically and inviting society to align with its essential truth — that all people have worth, value, and dignity. By becoming a scholar in our Postgraduate Program, not only will you be joining our legacy of change-makers, you will get around 200 hours of therapy and interpersonal supervision and around 148 hours of CE credits (NBCC and APA; Some RPT) for $8995! Currently, postgraduates save $10,420 on all eligible workshops, therapy, and supervision. Postgraduates may begin in September, February, and June. If you know that you are ready to step across the space between where you are and where you want to be — personally and professionally — and are ready to apply to the Postgraduate Training Program, call us at (919) 929-1171.